People often don't hear the phrase, "You are the most important person in my life today," especially from those other than family. However, Leslie Milde, M.D., has heard it often — from her patients. She is well aware of the significance of her role in the operating room, and the apprehension felt by patients about to undergo surgery. Now the tables are turned, and as one of the first five patients undergoing proton beam therapy at the newly opened Mayo Clinic Building in Phoenix, Dr. Milde, former chair of Mayo's Department of Anesthesiology in Arizona, is relying on key people in her own life — the team of specialists treating her spinal meningioma, a condition where tumors arise from the membranes that surround the brain and spinal cord. Her condition was discovered after an auto accident in 1994 resulted in a surgery that also revealed calcification in her thoracic spine. Dr. Milde was told by her medical team that she would require careful observation for a number of years, because the tumors could continue to grow and compress on her spine. Treatment for a meningioma depends on many factors, including the size of the tumor, where it's situated, and how aggressive it's believed to be. Treatment options include surgery, which is typically the first line of treatment, radiation therapy, radiation and medications. The medical team also takes into consideration a patient's overall health and goals for treatment. "This is the definition of the Mayo Model of Care. It's the teamwork. Everyone is all in." – Leslie Milde, M.D. Although these tumors are usually benign and don’t present symptoms, Dr. Milde was warned that because of her tumor's location, its growth could ultimately lead to paralysis. She has remained vigilant, and has been under the watchful eyes of Naresh Patel, M.D., a Mayo Clinic neurosurgeon, and Sujay Vora, M.D., a Mayo radiation oncologist. After discussions with Dr. Milde, the multidisciplinary team caring for her advised that radiation treatment, and proton beam therapy in particular, was the best course of treatment for her. "Traditional radiation is effective," says Dr. Vora. "But, proton beam could provide additional protection of healthy tissue." Because her tumor was slow-growing, she was able to wait three years for the grand opening of Mayo Clinic's Proton Beam Therapy Program in Arizona. Dr. Milde requires 25 sessions of exacting, precision radiation therapy, delivered by skilled, caring professionals who also have been eagerly awaiting the full breadth of potential that proton beam therapy can bring. As a seasoned professional whose career has spanned practice, research and education, Dr. Milde takes pride in her role as an anesthesiologist. "You aren't just putting the patient to sleep," she explains. "You are in charge of how the patient will do, during surgery and after, making sure they won't be sick, or in a lot of pain." 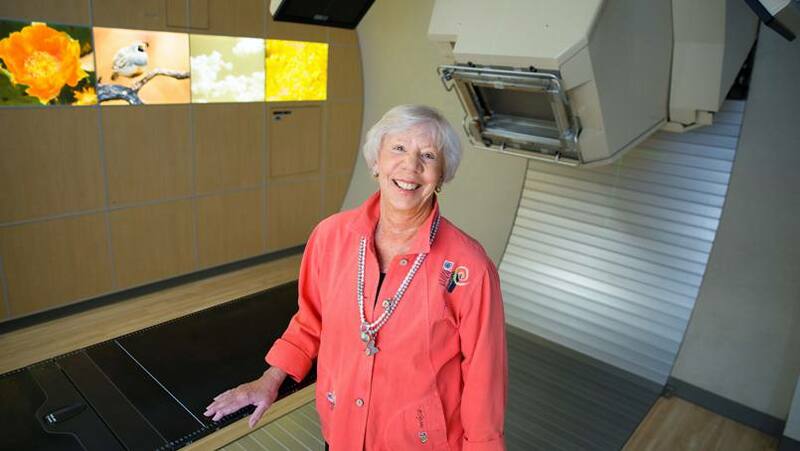 She often hears the question of her proton beam therapy treatment, "What is it like, alone in the treatment room, while getting the therapy?" She says it is "quiet and peaceful." And she likes the calming images of nature and animals on the ceiling. Most importantly, Dr. Milde says her expectations have been met — and exceeded. "This is the definition of the Mayo Model of Care," she says. "It's the teamwork. Everyone is all in." Learn more about spinal meningioma. Connect with other patients on Mayo Clinic Connect. Learn more about Mayo's s Proton Beam Therapy Program.